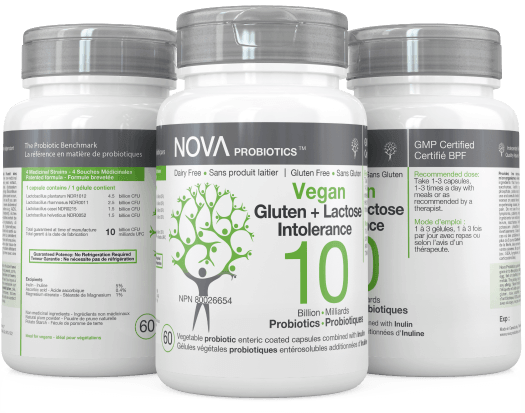 This product is designed for individuals with food sensibilities such as gluten and lactose intolerance. One capsule provides 10 billion live-microorganisms in the gut to promote healthy intestinal flora balance. The product is made to assist proper digestion and break down of lactose, casein and gluten. Prevents bad bacteria from sticking to the lining of the gut. Gluten free, Dairy free, Non-GMO. Products with guaranteed potency. No refrigeration required. Enteric-coated capsules are designed to remain intact in the stomach, after which they release the total active substance in the upper intestine.